Something truly bizarre is happening! It's as though some cosmic enforcement of mandatory carpooling is occuring. Lone drivers are vanishing...along with their gas guzzlers! Is it The Rapture? Probably not, since famous atheist Hitch Tawkins is among the disappeared. Will U.S. citizens be forced to take public transportation, or God forbid, ride bikes forever? There is a lot going on in this enjoyable book. Reading it is like watching a plate-spinning act. You need to keep your eyes on, well, everything. There are evil plots, diet riots, Amish wannabes, secret bus trips to the Wisconsin Dells, soft rock flashbacks, The Order of the Analogy, and clues hidden on Hard Rock Cafe memorabilia. The action spins around the globe as a few brave souls race to solve the riddle and save mankind from an uncertain fate. If it's possible that Tom Smucker hasn't used all his fictional ideas writing this book, I'll be more than happy to read his next work. 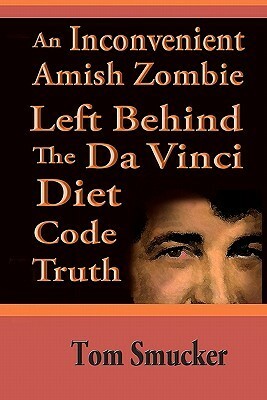 Sign into Goodreads to see if any of your friends have read An Inconvenient Amish Zombie Left Behind the Da Vinci Diet Code Truth.